My first full day in Japan begins uber early by tanking up with a hearty breakfast. Buffets at hotels are par for the course in Japanese hotels and I started with a plate load of breaded fish, salmon, scrambled eggs, sausage, and bowls of rice and miso soup. I like my rice with sprinkles and pickled vegetables. Its a lovely sunny first day as the morning light streams in through the windows. Man I just want to keel over from all that food, but no time to waste… I’m setting out for the town of Sawara, former home of Ino Tadataka, the first man to make a comprehensive map of Japan. I hoof it to JR Narita Station and ask the ticket office which platform to use for the next train to Sawara, track #5. I use my Suica card for the first time. Purchased a ticket at the Narita JR station and waiting on platform 5 for the train to Sawara. JR Narita is a nice, old station with that rusting era of deprivation character. Birds serenade me with their throaty song as I wait. Sudden change of trains, but there’s the whistle, announcements and we’re off! Asking a couple in the street for directions. Other side of the tracks. Yosh! Visiting the local travel and information office and discover that there’s a festival starting today and ending on the 14th, and I have the whole day to spend touring Sawara. This is the kind of serendipity I’m famous for when in Japan! While in the travel office I also buy a pair of very handsome “furoshiki” used to wrap packages or belongings when adventuring in Japan and making maps. The Fall festival is glorious with various groups parading what can only be described as “party barges” bearing giant effigies on the top of the float. These are not “Mikoshi” because there doesn’t seem to be a deity in residence, although the Fall Festival is hosted by the local shrine. The Fall Festival is a huge deal in Sawara and involves a dozen or so floats and street vendors and games like catch the goldfish. Many of the elderly were out with their families, reliving memories of past festivals. Many children being doted over by their grandparents experienced the Fall Festival for the first time. Chatted with a few residents of Sawara and admire them for their classic, old lovely homes. Time to deploy the video camera and H4N audio recorder to capture this one time experience! Interestingly enough so are dozens of other Japanese onlookers. Asked a Japanese police officer for directions to Ino Tadataka’s house. Suddenly those Japanese study sessions featuring the words “migi” and “hidari” came in handy. Ino Tadataka’s house is more than just a house, there’s a modern museum dedicated to him as well as a complete river side neighborhood that really looks like it was lifted out of old Edo. 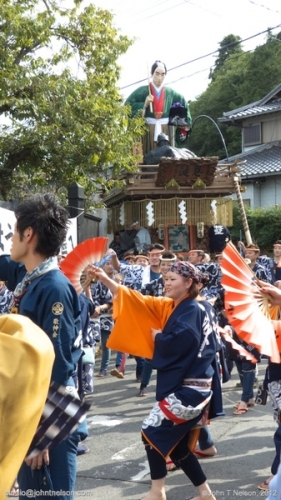 The festival floats roll down the modern asphalt street and found there way winding through the old stone streets of Edo period Sawara. Ironically, Ino Tadataka’s house is under canvas for renovations so even although I’ve found it, I can’t actually see it or film it. I’m beat, tired and dehydrated… and what do we do when we’re dehydrated? Why we look for the nearest vending machine that dispenses “Match” vitamin drink, and I found one! After refreshing myself I wander about the town, taking “B roll” footage and enjoy the watching the rest of the street festival. Near the railroad tracks I watch with bemusement as one of the floats is rolled across the tracks soon after a train has crossed. The time has come for me to leave this party but I’ve just discovered that I’ve lost my Suica card! Now I have to purchase a ticket with cash and most likely cough up another Y500 for a new Suica card. Well its not like that’s the first time in history that this has ever happened. The train ride back to Narita is relaxing after a day well spent behind the camera. I have a few minutes before the train arrives so I use the station “Toerei.” After washing my hands I find there are no paper towels or blow dryers but I’m unconcerned because smart first time travelers always carry a handkerchief with them in case the rest room doesn’t have any way to dry your hands. This happens a lot more often than you might think! Wrapping up the day munching my chilled chocolate eclair while watching baseball news. Oh wow, the Orioles still have a chance at the World Series! Looking back on a well spent day full of serendipitous goodness and a mountain of video and audio tracks I have to edit. Only bad thing about the trip so far… I lost the Suica card.